Combine this Gruyere Grits with Mushrooms and Crispy Bacon with a crunchy green salad and you’ll have a wonderful lunch or dinner. Creamy cheesy white grits with crispy baked bacon is a very satisfying dish. A coarse ground type of grits with flavorful Gruyere, bacon baked to a crisp and slices of mushroom baked with a sprinkle of lemon juice. Grits with cheese or anything else savory, is something I learned to eat here in the US. I was used to eat grits as a breakfast or a dessert and was not particularly fond of it. 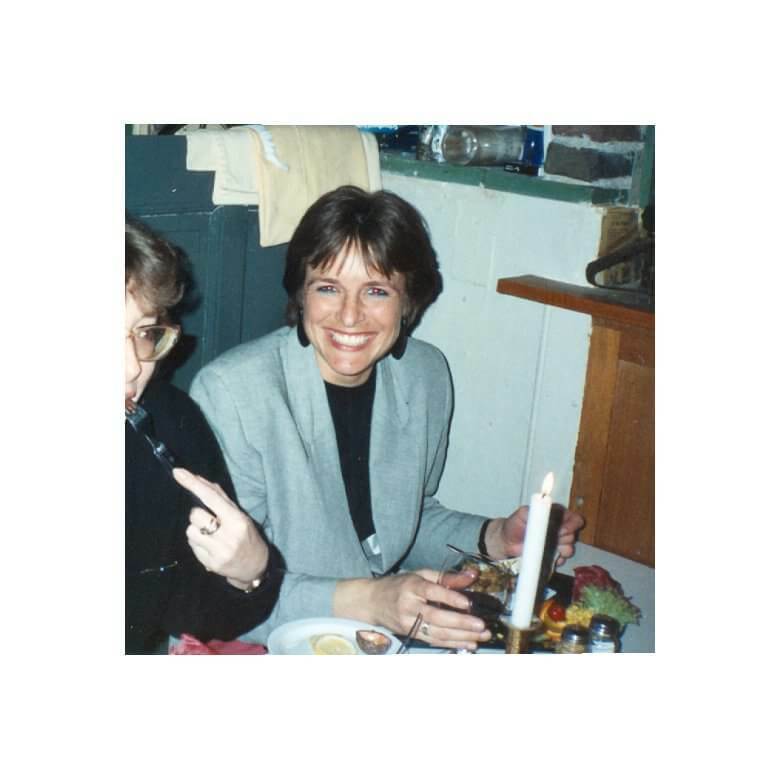 As breakfast it is served warm with milk, like a porridge and as a dessert, my mother made it, not very often, but when she made it, it was like a pudding with some kind of fruit sauce. A rather tasteless dessert that was acceptable because of the fruit sauce, but not very popular in our family. One day I, years ago and found grits on a menu in a restaurant. Not knowing what it really was, I tried it. That’s what I do, I try things, especially things I don’t know. I liked it, only to find out years later that what grits really was and that I had tasted it already, only prepared in a totally different way. I have to say that I do like the savory grits over the more sweet grits from the past. That said, my taste may have changed and I will certainly try a sweet grits recipe again – you’ll never know. One new thing I learned, living here in the South is the use of stone-ground grits as apposed to regular or quick grits. 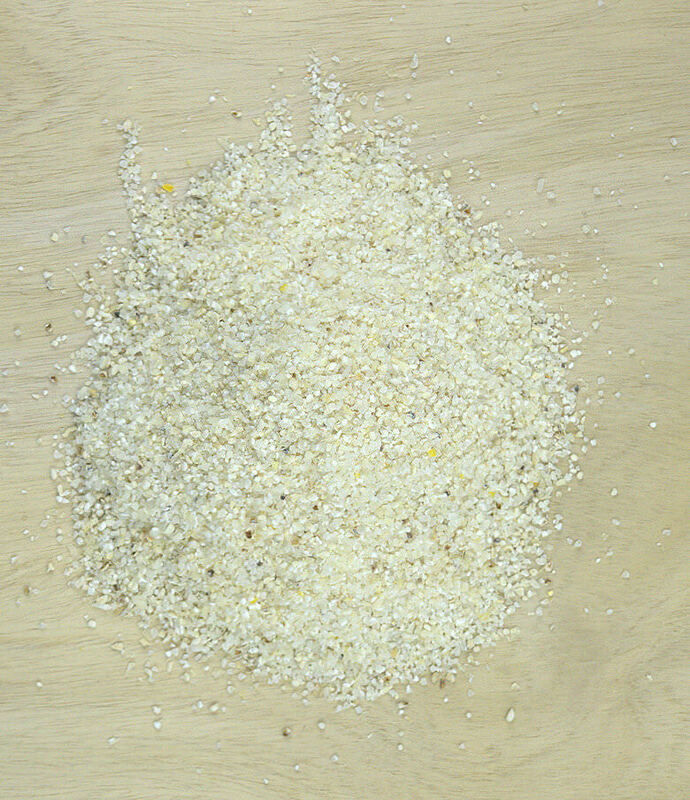 The stone-ground version of grits is so much more flavorful and so much more texture, it’s like a whole grain version. These stone ground grits do need an extra step in the preparation. In order to get rid of pieces of bran, you cover the grits with water and stir; allow the grits to settle and then pour the water off the grits, together with the bran that is floating on top of the water. What is left is your grits. This recipe can be made with any type of grits, yellow or white. Just follow the instructions on the packaging as they may differ from the one I used. I cooked grits in water, stock, milk or cream or a combination and found that for plain grits, the addition of milk or cream may be nice for the extra creaminess, however I do believe that it is not really necessary. Great grits don’t need that addition. 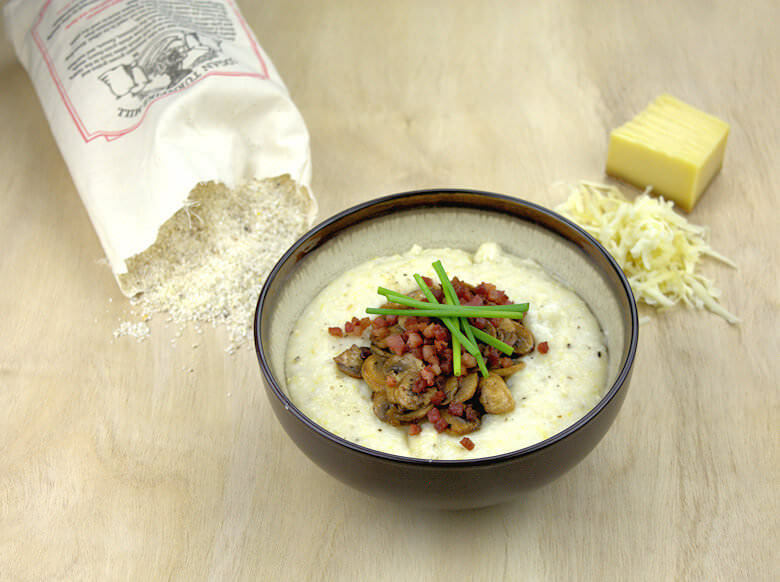 If you make cheesy grits, like this Gruyere Grits with Mushrooms and Crispy Bacon, I definitely think you do not need to add milk or cream, just extra calories and no change in flavor. Same for the stock; if you make a plain grits, then the stock may give you a little bit of extra, but for a grits with a lot of additions, the additional flavor of the stock gets lost. 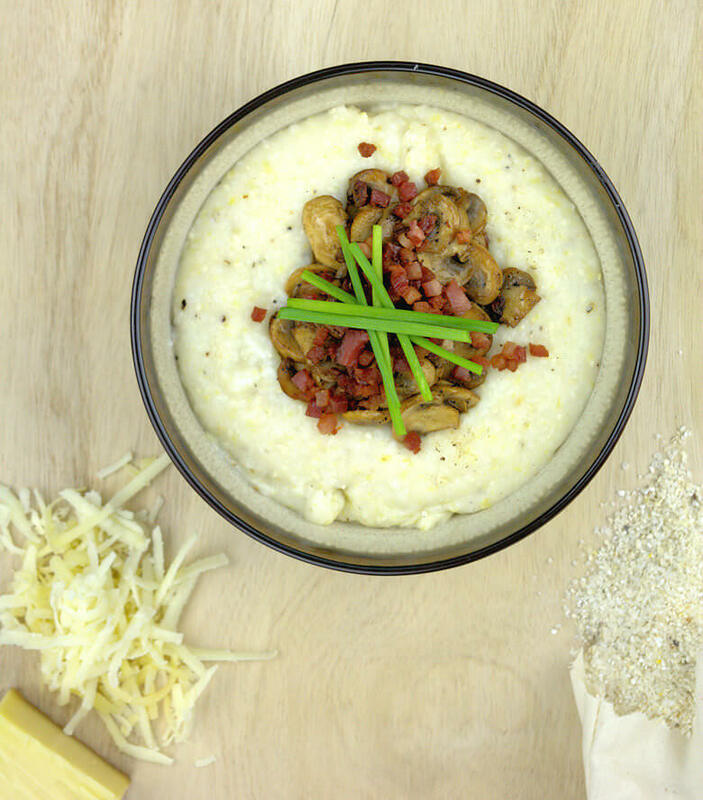 The recipe for this Gruyere Grits with Mushrooms and Crispy Bacon is rather easy. Cook grits in water. Please check the packaging of the grits you’re going to use; they will be differences. The directions on the speckled stone ground grits I used show how much water per cup of grits per person and it also shows the cooking time. One more side step. I also like the speckled grits because of the speckles 🙂 You can see them in the pictures, adds color, adds texture, and all because the stone grinding process utilizes the whole grain. We were still cooking the grits, with water only. While this is going on, start baking the mushrooms and the pancetta or other bacon if you like, separately. My favorite way of baking mushrooms is to slice them and bake them slowly. This way the mushrooms release the moisture, then, bake them for a short while on high heat, while adding some lemon juice. The flavor of the mushrooms is enhanced, more clean. For this recipe I cut the pancetta in small cubes and baked those tiny cubs crisps, my husband would say ‘burn the bacon’. For the cheese, I picked a Gruyere; a Swiss cheese with a strong flavor, but not too aggressive. Any cheese can be used; a cheddar, jack, Gouda. I would pick an aged cheese, something with flavor that will not be overpowered by the pancetta and mushrooms. Ready to assemble the Gruyere Grits with Mushrooms and Crispy Bacon? Mix the grated cheese with the grits. Taste and add salt and pepper if you think its needed. Divide the grits over 2 bowls or 2 plates, place the mushrooms in the middle of the grits and on top of that the pancetta. Finish with chives, strips or chopped. Combine this Gruyere Grits with Mushrooms and Crispy Bacon with a crunchy green salad and you'll have a wonderful lunch or dinner. Creamy cheesy white grits with crispy baked bacon is a very satisfying dish. A coarse ground type of grits with flavorful Gruyere, bacon baked to a crisp and slices of mushroom bakes with a sprinkle of lemon juice. Cover the grits with water and stir; allow the grits to settle and the pour the water off the grits, together with the bran that is floating on top of the water. Combine 2 cups of water and 1/2 cups of grits and bring to a boil. Please check the directions on your grits as they may differ from brand to brand. Turn the heat down and simmer uncovered for approx. 30 minutes. Stir periodically until water is absorbed and grits are thickened; add more liquid if necessary. While the grits are simmering, clean and slice the mushrooms and cut the bacon in tiny cubes. Heat the oil in a skillet and add the mushroom, bake them slowly, so all the juices evaporate. Once done, add the lemon juice. Bake the pancetta crispy in a separate skillet. Transfer the bacon to a plate with a few layers of kitchen towels that will absorb the grease (you will not need it for this recipe). While the mushrooms and bacon are baking, grate the cheese. Cut the chives in strips or chop it. Combine the ingredients. Mix the cheese into the grits and season with salt and pepper. Divide the grits over 2 plates or bows, then divide the musrhooms and the bacon on top of the grits and finish it with the chives.